Gold award winner Salvador I. Brito deleted particular genes in human cells infected by hepatitis C virus to determine if that affects the ability of the virus to grow in the cells or the expression of the cell. 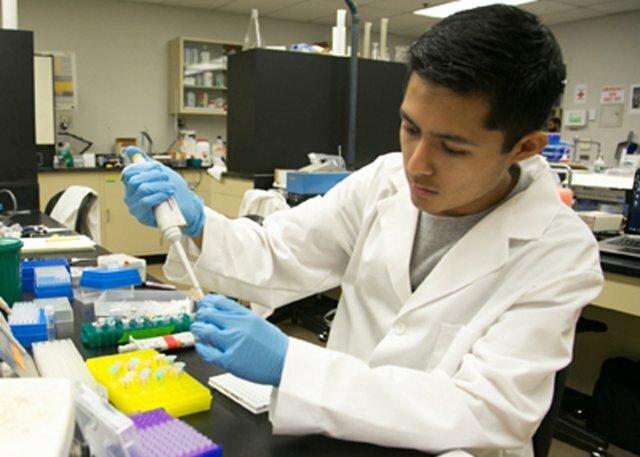 (THOUSAND OAKS, Calif. – Oct. 1, 2014) Thirty-six of California Lutheran University’s top undergraduates will present their research findings at the 11th Annual Student Research Symposium on Saturday, Oct. 18. The event, which will include presentations of awards to five students, will be held from 9 a.m. to 1 p.m. in Ahmanson Science Center on the Thousand Oaks campus. With guidance from faculty mentors, the students conducted research in the fields of biochemistry, biology, chemistry, computer science, exercise science, global studies, mathematics, psychology and religion. Most of the students spent the summer working full time on their projects. Three students will receive awards for dedication and excellence. Gold award winner Salvador I. Brito, an Oxnard resident majoring in biochemistry and molecular biology in addition to psychology, deleted particular genes in human cells infected by hepatitis C virus to determine if that affects the ability of the virus to grow in the cells or the expression of the cell. Silver award recipient Su Ji Hong, a mathematics and physics major from Ventura, created mathematical models to describe the queuing system of Cal Lutheran's Centrum Cafe. Bronze award winner Sharena Rice, a Simi Valley resident majoring in biochemistry and molecular biology and minoring in psychology, researched when certain proteins that regulate lipid transport appear during the development of the retina. Carla De Lira of Los Angeles and Alicia Vanessa Nuñez of Canoga Park will receive the symposium’s first leadership awards. They served as peer leaders for the summer researchers and organized weekly gatherings. De Lira, a computer science major now serving as the Office of Undergraduate Research and Creative Scholarship (OURCS) assistant, studied the efficiency of using Live Code to create software for multiple operating systems including desktop, laptop, tablet and smartphone devices. Nuñez, a psychology and Spanish major, explored the cognitive mechanisms used in forgiveness in older adults. After the presentation of awards, six students will give oral presentations from 9:15 to 10:30 a.m. in Richter Hall. All the students will present their results in demonstrations and posters and talk to visitors from 10:30 a.m. to 1 p.m. in the Atrium. Refreshments will be served. Original results shared at the symposium are presented at professional conferences throughout the country and may be published in peer-reviewed journals. Ahmanson Science Center is located at 3260 Pioneer Ave. Admission to the symposium, which is sponsored by the OURCS, is free. For a complete schedule, visit CalLutheran.edu/OURCS. For more information, call 805-493-3796 or email OURCS@callutheran.edu.